I am looking into the feasibility of re-introducing a School Crossing Patrol (SCP) in Porthleven between the bus stop and Sunset Gardens. This stretch of road is rather busy, and it is claimed by many to be fast. Many will know there used to be a SCP, but this stopped many years ago and no one seems to know why. The plan is for this site to be inspected for suitability for the (which it is) SCP. Then a survey is undertaken on how many cars travel along this stretch of road at school times. Once this data has been collected, it is compared with national guidelines. If it does meet those guidelines a report is written supporting the SCP. Of course, with any scheme there is a cost. In general terms a site setup can cost around £3000. This includes signage, flashing lights and drop kerbs. There is also an average annual cost of around £4500 of running and staffing a site. In the meantime I am also looking at placing another ‘island crossing’ in the same area. This will be similar to the one I had fitted between the Boating Lake and the Fairground Car Park. However, the cost of this is likley to be in excess of £10,000, and my highways budget has been fairly depleted because of other projects like Gibson Way. Still, I will keep trying. 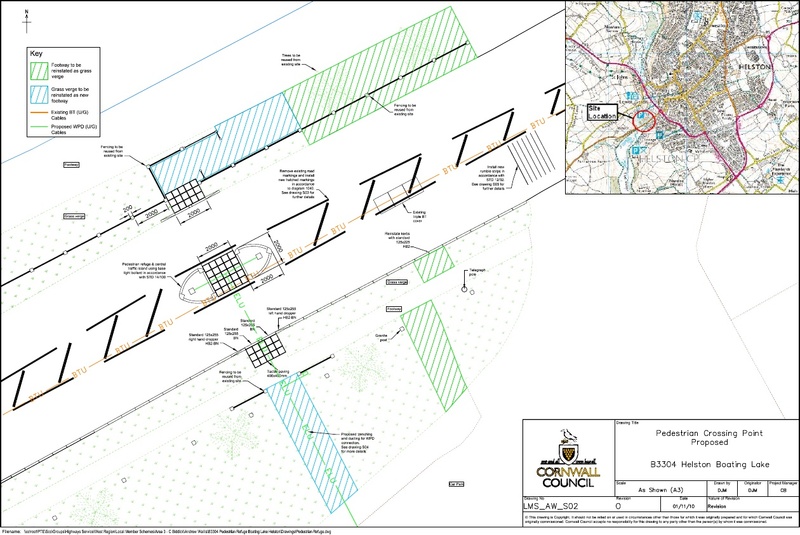 It has been quite a few months since I last posted on this subject; mainly because I had been working behind the scenes with Highway Engineers to come up with a plan that works, and more importantly, have the money to pay for it. I am happy to now announce that I do have a scheme, and the money to pay for it from my Members Highway Grant. 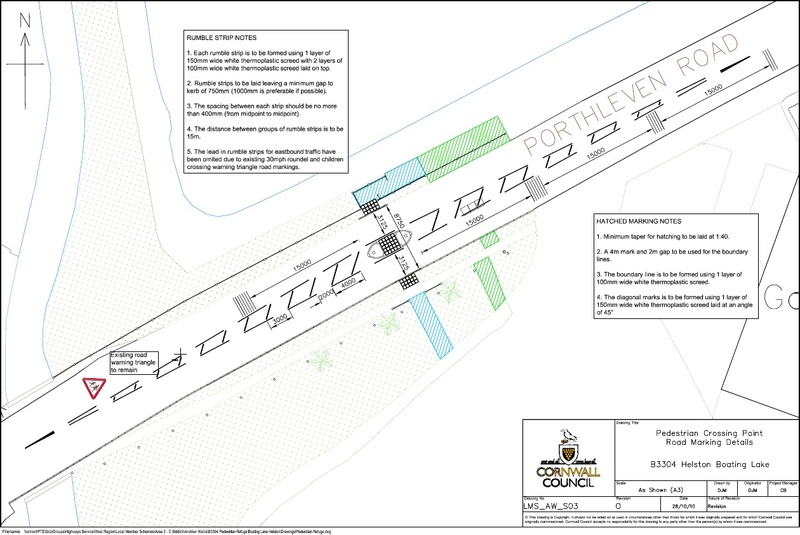 As anyone who knows this area the crossing is going to be situated between a large free car park and Coronation Park which includes the well used Skate Park, Children’s Playpark and Boating Lake. I had hoped that this was going to be a full pedestrian crossing with either lights, or beacons, but due to the location of the crossing it would have just been unaffordable due to the utilities that would be required. In the end I opted for a refuge type crossing, rather then bin the whole idea. I feel some sort of crossing is better than what is currently there, which is nothing. Below are the drawings of what is planned. The date for all this work to start is mid January and it is hoped to be completed within a few weeks after that. Of course, this date could slip right, but I am hoping the weather will be kind enough for this to take place in January.